Front Range HVAC offers the best in commercial boilers available from Carrier, the leading name in high-quality, industrial-grade heating, ventilation, and air conditioning solutions. Carrier has been building leading-edge HVAC units since 1902, and their legacy of excellence pairs well with the outstanding service work that Front Range HVAC prides itself in providing. The commercial boiler sales process doesn’t have to be long and frustrating. In most cases, we can quickly identify the ideal commercial boiler for you, choosing from Carrier’s impressive lineup of the most efficient, reliable commercial boilers available anywhere. At Front Range HVAC, we know how important it is that you make the most sensible, budget-friendly commercial boiler purchase you can make. We realize that this significant investment into your commercial building is one that should pay dividends for decades, in the form of consistent comfort for every zone in your building. Identify the make and model of the boiler to be replaced. Unless other changes are being made to the radiant heat system, we’ll use the specifications and size of the old boiler to help guide you to the optimal Carrier commercial boiler to replace it. If there are better, more efficient models available to you, we’ll inform you of their costs and other considerations. If there is no boiler to replace and this is a new installation, a qualified Carrier boiler expert from Front Range HVAC will visit your location to assess it for compatibility. 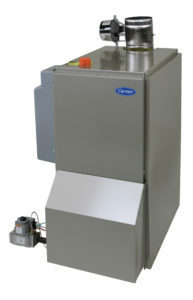 Make a recommendation for the most suitable, cost-effective commercial Carrier boiler for your unique needs. Every commercial building has different heating, ventilation, and air conditioning requirements. At Front Range HVAC, we work with you to arrive at a thorough understanding of where and how your new boiler will be installed, keeping you informed of all of your options along the way. Install the boiler and test it for operational tolerances according to the manufacturer. If you’d like us to do the boiler installation for you, then great! We’ll pick a time and date that works best for your schedule. Or, if you’d rather have another company perform the installation, we’ll be more than happy to arrange the shipping and address any logistical concerns you may have. We treat every new commercial boiler sale as an opportunity to help a fellow Colorado business invest in its future. There is a lot that goes into selecting the right commercial boiler, and we do everything in our power to make sure that the process is as quick and as hassle-free as possible. To learn more about the best Carrier commercial boiler for you, contact Front Range HVAC by calling (303) 942-1372.